Prices shown are exclusive of VAT and are subject to a 12-15 working day lead time. Express delivery available on this product, please call for details (surcharge applies). The Rodeo USB and Black Flip Box bundle offer a sharp, professional packaging solution for any photographer's out there at an affordable price. The faux leather Rodeo USBs are available in either white or black leather and finished off with a polished chrome bevel. 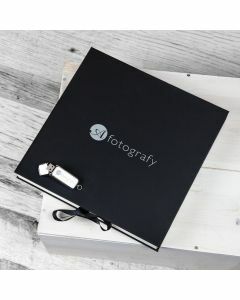 They can be printed with your logo in full colour or alternatively embossed (included in the bundle price). The black box that the USB sticks are supplied in features a custom cut foam insert to securely house the sticks and have a magnetic strip for opening and closing them with ease. They can be printed onto in full colour on the front (included in the bundle price) or can be printed on both sides for a small additional fee. The bundle price includes all the design support, set-up and printing (or embossing) on the USB sticks (both sides) and the boxes (one side). 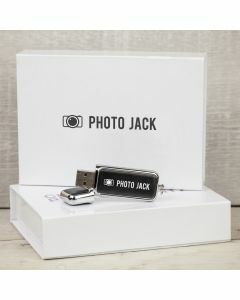 It includes a White or Black Rodeo faux leather USB stick (USB 3.0 chipsets) of your chosen capacity and Premium Black box with a custom foam inserts for every USB stick supplied.